As a card-carrying member of Generation X, I have very specific ideas of what constitutes an action movie. Having been reared on classics like Die Hard, Rambo: First Blood Part II, and RoboCop, I respect movies which feature strong characters who know exactly what they are doing, even in the face of insurmountable odds. These movies also don't shy away from ultra-violence, which can often border on cartoonish levels of ultra-violence. However, for some reason, these movies have fallen out of vogue. But, 2013's Olympus Has Fallen attempted to bring that kind of action back to the screen. That movie had its flaws, but it was also an uncompromising action movie which did not shy away from having the bullets fly. 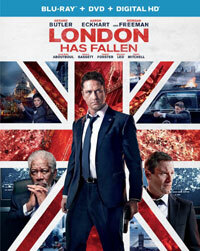 Now, the action has moved across the pond with the sequel London Has Fallen. London Has Fallen brings us back into the world of Secret Service agent Mike Banning (Gerard Butler). Banning is enjoying life serving President Benjamin Asher (Aaron Eckhart) and spending time with his wife, Leah (Radha Mitchell). But, Mike has also decided that it's time to leave his post. When the Prime Minister of England dies, Mike decides that accompanying Asher to the funeral will be his last assignment. They travel to London, along with Secret Service Director Lynne Jacobs (Angela Bassett), and after landing, make their way to the funeral. However, when they arrive at the cathedral, all hell breaks loose. Explosions tear through the city, killing many world leaders. A group of terrorists dressed as police officers open fire on Asher. Banning is able to get Asher and Jacobs into a car and whisk them away from the scene. After a series of mishaps, Banning and Asher find themselves fleeing through the streets. Will they be able to shake a city full of terrorists? I can easily see how viewers could have been divided on Olympus Has Fallen. Is it a loud, stupid movie? Maybe. But, I saw it as a return to a sort of no-holds-barred action movie that Hollywood had forgotten. You take a plot which has a touch of politics, a broken hero, and a desperate situation, pepper in a surprising amount of violence and you've got a movie like Olympus Has Fallen. However, it wasn't brain-dead. It wasn't chock full of surprises, but it was clever enough to keep the audience engaged and featured enough eye-popping deaths to keep the juices flowing. Well, if it ain't broke, don't fix it. London Has Fallen spends a few minutes setting up the story and then it's a non-stop action ride for the remainder of the film. Car chases, gun fights, fist fights, sieges, explosions, and the destruction of landmarks -- this movie has it all. The movie takes just a few moments to catch its breath, and something is always happening. Those who were disappointed with Asher's behaviors in the first film will love the fact that the President picks up a gun and gets actively involved. As for Mike Banning, he proves to be an indestructible super-hero who can't be hurt or stopped. Now, if you want to examine the story, you'll find some issues. The opening and the motivation behind the terrorist attacks makes sense, but you can't help but wonder how the terrorists knew where some of their targets were going to be, especially since two of them appear to have wandered off of the beaten path. Once the big action sequences begin, logic really flies out the window. Banning is able to dodge bullets, be a master of stealth, and seemingly know every move that the enemies are going to make. The third act really gets wacky, especially the moment where he suddenly arrives to save the day. But, stupid or not, this is one of those movies where more forgiving action movie fans can set aside nitpicking and simply dig the maelstrom. When London Has Fallen was released in theaters, I seem to remember some controversy regarding the subject matter. If anything, the movie should be applauded for not backing away from topics which are ripped from the headlines. Is it insensitive to portray scenes which are reminiscent of things like the attacks in Paris? Perhaps, but the movie is simply reflecting real-life...well, up until Banning begins his heroic tactics. Iranian Director Babak Najafi doesn't shy away from showing the mistakes which both sides, and the ultimate message may get lost in there somewhere, but, again, if you want action, London Has Fallen is a can't-miss. London Has Fallen features the oddest cast of war-room actors ever assembled on Blu-ray Disc courtesy of Universal Studios Home Entertainment. The film has been letterboxed at 2.35:1 and the Disc contains an AVC 1080p HD transfer which run at an average of 34 Mbps. The image is very sharp and clear, showing no overt grain and no defects from the source materials. The colors look good and the image is never overly dark or bright. The level of detail is excellent, as the picture is never soft and we can see the lines on the actor's faces. The depth is good as well, as the actors are clearly separate from the backgrounds. The Disc carries a DTS-HD Master Audio 7.1 track which runs at 48 kHz and an average of 5.5 Mbps. The track provides clear dialogue and sound effects. This is one of the best tracks that I've heard in a while. The surround sound effects are incredibly detailed. In the action sequences, one can pick out individual and distinct sounds. The sounds don't merely mimic the front channels, but present sounds which are representative of what's happening behind the characters. The stereo effects are good as well, offering great separation and great detail. The subwoofer effects are powerful and even explosion and gunshot is palpable. The London Has Fallen Blu-ray Disc contains only a small of extra features. "The Making of London Has Fallen" (13 minutes) takes us on-set to see several key scenes being shot. We hear from the actors, who discuss the characters and stories, as well as the creative team, specifically Director Babak Najafi. The locations in London are explored, as well as the visual effects used to destroy the city. "Guns, Knives, & Explosives" (8 minutes) looks at the film's stunts, taking us on-set to see how the action scenes were created.